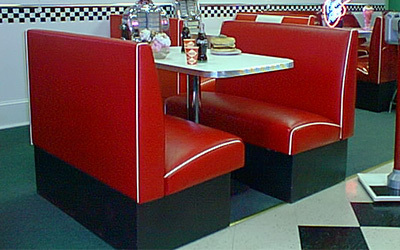 Our Drive In Diner Booth Set is comprised of two 44″ smooth back benches upholstered with a single color vinyl and contrasting piping. This model is complemented by a 24″ x 42″ table top with 1.25″ real metal banding and a Classic Chrome Column Base. You may choose the color of the bench, piping and laminate from any of our standard vinyls and laminates. Call 304-728-0547 to place your order. One phone call can put your booth set into production today! Booth Specs: 24″D x 36″H x 44″L (perfect seating for four). Table Specs: 24″D x 42″L. Our Drive In Booth Set is priced as shown in Standard vinyls. Also available in your choice of any Stratford or Seabrook vinyls to match your home decor perfectly! Questions? Send us an email, use our CHAT feature, or call 304-728-0547 and one of our retro specialists will respond right away. We offer a great commercial customer discount when ordering in large quantities. Let us help you build your diner or retro restaurant.